Arizona Game and Fish Department wildlife managers have seen an increase of roaming bear activity statewide in their quest for easy sources of food and water. 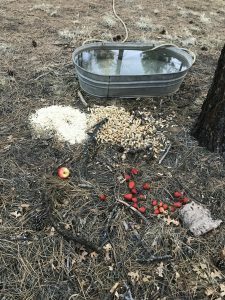 Officers found this cache of food and water when seeking a habituated bear near Pinetop on Sunday. On Monday, AZGFD wildlife managers removed a sub-adult male bear from the north Phoenix neighborhood of Anthem that had previously been relocated from Prescott. On Sunday, officers in the White Mountains were forced to remove a habituated female bear feeding on large piles of food and water left by a local resident. Call 911 if you’re in a life-threatening situation with a bear. To report a bear sighting in an urban area or neighborhood, please contact your local AZGFD office or the department’s Radio Room at (623) 236-7201. For a brochure on living with bears, visit any AZGFD office. Please visit: www.azgfd.com/Wildlife/LivingWith.